An Old World species cultivated for ornament and occasionally escaped from cultivation to roadsides, shores, pastures, hillsides, meadows. First collected in 1901 in Wayne Co. Very distinctive in its deeply lobed leaves, which are smaller than in other species in the genus (blades up to 6.5 cm broad but usually less than 3 cm broad, except on sprouts). MICHIGAN FLORA ONLINE. A. A. Reznicek, E. G. Voss, & B. S. Walters. February 2011. University of Michigan. Web. 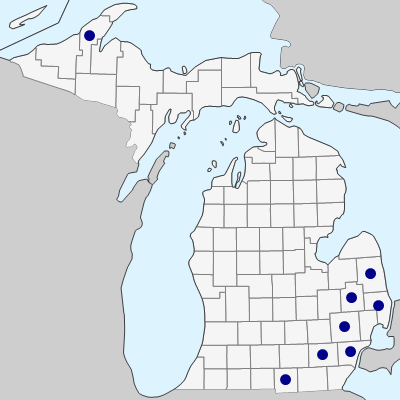 April 21, 2019. https://michiganflora.net/species.aspx?id=2466.